With the construction side of a major project to remove and keep common carp out of the Sandhills lakes on the Valentine National Refuge complete, the next phase – actually eliminating the carp – will begin in late 2018 with the renovation of three lakes, including Pelican Lake. Water control structures like this one have been installed in the outlets to most refuge lakes. Native to Europe, bottom-feeding carp stir up sediments and cloud the water, hampering the growth of the aquatic vegetation that is the base of the food web, and the growth and productivity of sight-feeding gamefish, including the bluegill, yellow perch, black crappie, largemouth bass and northern pike that thrive in Sandhills lakes. Carp found their way onto the refuge in the 1930s when a ditch was dug from Gordon Creek northwest of the refuge to alleviate low water. 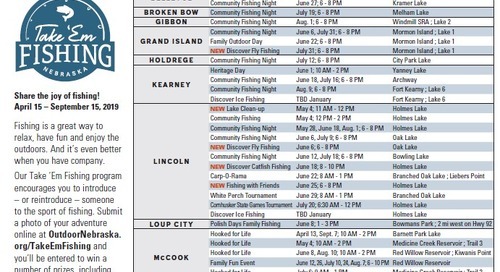 Nine of the 36 lakes on the 71,516-acre refuge in Cherry County are open to fishing. In the 1970s and 1980s, rotenone, a chemical that kills gill-breathing organisms, was used to remove carp from the seven fishing lakes where they were present. The waters quickly cleared and the refuge developed into a world-class fishery renowned for producing trophy panfish. The nature of Sandhills lakes, with cattail-lined shores and adjacent marshes, however, made it difficult to kill all of the carp in a lake, and the ditches and creeks connecting the lakes allowed carp to find their way back in. That was most recently seen in Hackberry Lake, where carp reappeared soon after a 2004 renovation. Duck and Rice lakes were carp-free prior to these early renovations and remain that way. West Long Lake has remained carp-free since it was renovated in 1976. All three continue to produce quality panfish and largemouth bass. Biologists have found that when carp populations reach a certain level, the body condition of gamefish begins to decline. In the other fishing lakes – Watts, Pelican, Hackberry, Dewey, Clear and Willow lakes – carp levels were at or well above those levels when work began. 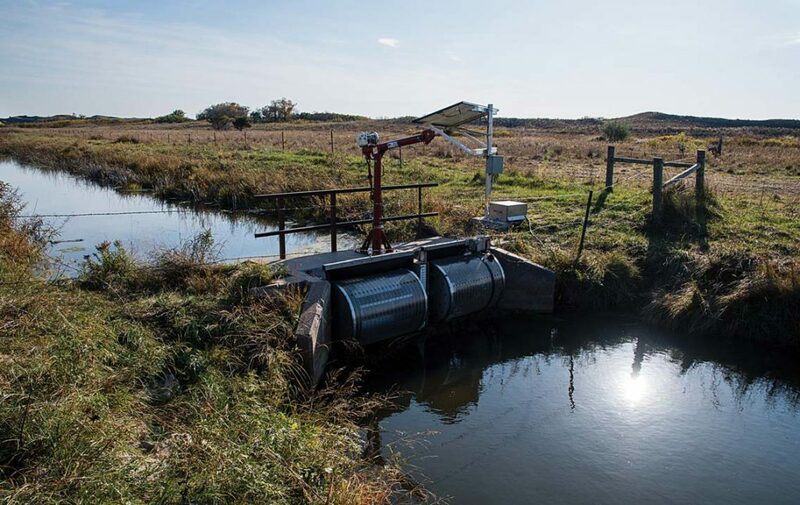 Biologists and engineers have been working together on the current project, a cooperative effort between the Nebraska Game and Parks Commission, its Aquatic Habitat Program and the U.S. Fish and Wildlife Service (FWS), to find a way to keep carp out of the refuge lakes once they are removed. Water control structures have been installed. New or redesigned water control structures on the outlets below each lake will keep fish from moving upstream into a lake, even during periods of high water, and to allow FWS personnel to manage water levels. Channels were dredged between the outlets’ main lake bodies to insure maximum drawdown prior to a renovation. The key piece to this puzzle is a barrier constructed on the stream below Willow Lake, the last lake in the system, which will prevent carp from finding their way onto the refuge from private lakes to the northeast. Separated from the other lakes, Watts Lake was the test subject for the process. 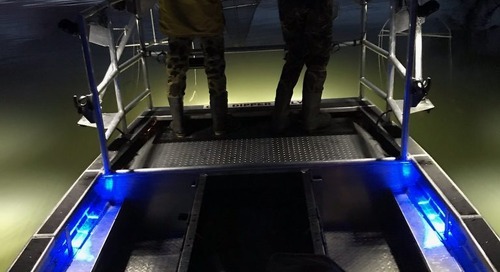 Work began there in 2014, and when it was renovated in 2015, managers were able to lower the lake 3 feet, drawing the water out of all of the vegetation to all but insure a complete kill of carp and cutting chemical costs in half. Growth rates of the bass, bluegills, perch and crappie stocked following the work have been excellent, and anglers began pulling keeper-sized fish from the lake this year. Biologists expect the same at the rest of the refuge lakes. 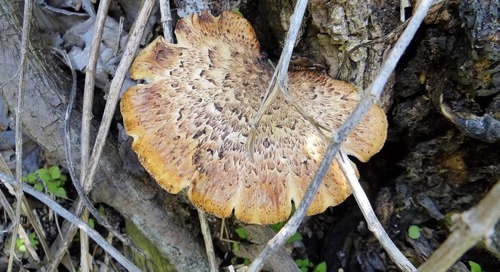 “They were phenomenal fisheries in the 1970s and 80s, and we think this work will get them back to that potential,” Commission Fisheries Biologist Zac Brashears said. A top-down approach to renovation is tentatively set to begin in August or September of 2018 with Pelican, School and Whitewater lakes. The latter two lakes aren’t open to fishing, but because of their connections to those that are and the presence of carp, they are being renovated. Work will continue in 2019 at Hackberry Lake; 2020 at Dewey Lake, and wrap up in 2021 with Clear; McKeel, another non- fishing lake; and Willow lakes. 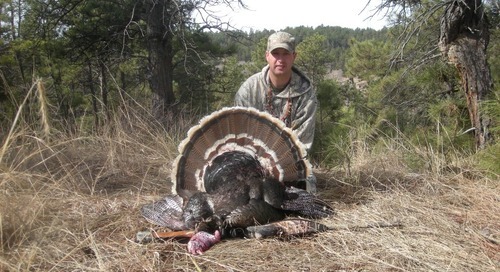 The staggered schedule will insure anglers always have several lakes to fish. Current length limits on pike and bass are planned to be rescinded starting this winter on Pelican Lake to allow anglers to harvest them with legal methods. Additionally, Commission biologists will trap, net and electro-fish lakes to collect gamefish and transfer them to other area lakes. The same process will be followed on the other lakes prior to their scheduled renovation. 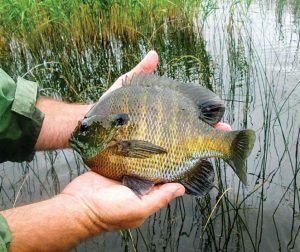 Following renovations, the Game and Parks Commission is proposing to allow only five bluegills in a 15-panfish daily limit to create a trophy bluegill fishery on Pelican Lake. They will also propose new pike length limits with a 24-inch minimum or no minimum with one fish over 34 inches on lakes where they are present. Because northern pike can affect the abundance and size structure of gamefish species, they will not be restocked in Hackberry and Pelican lakes, where they are currently present. Those two lakes, as well as Duck, Rice, West Long and Watts – the upper lakes in the system – will be managed for bass and panfish. Dewey, Clear and Willow lakes will be managed for pike, bass and panfish. Fish and anglers won’t be the only beneficiaries to the project. 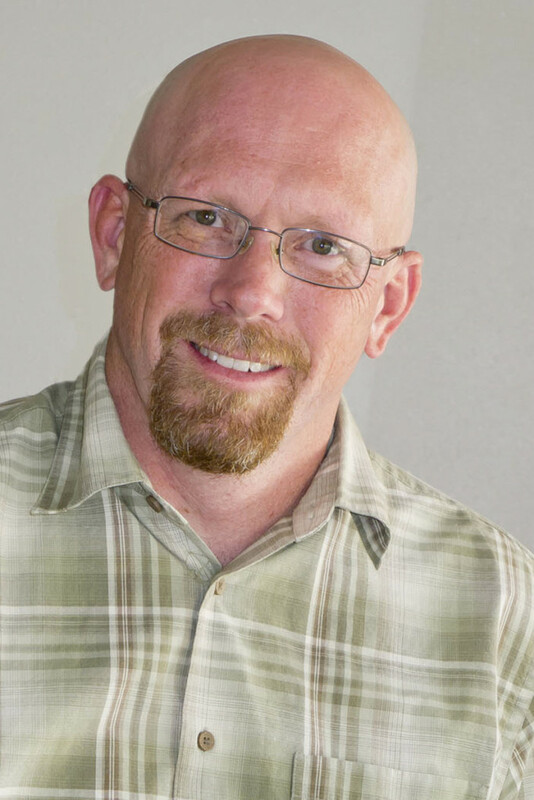 Eric joined the Nebraska Game and Parks Commission in 1998 as Publications Editor and has been a member of the NEBRASKAland staff since 2001. 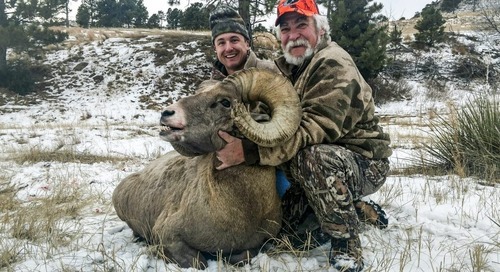 He is now regional editor and has won numerous awards from the Association for Conservation Information for writing and photography featured in the magazine. Daryl Bauer had this to say about the project in his latest blog post: “I have fished the Valentine Refuge lakes for a long time, on ice and liquid water. Northern pike, largemouth bass, yellow perch, bluegills, even a pumpkinseed and a grass pickerel have found the end of my line dipped in the holy waters of the refuge. I have fished those waters for most of my life, some of my first ice-fishing memories are on Pelican Lake, and I plan to fish them for the rest of my life however long that may be. 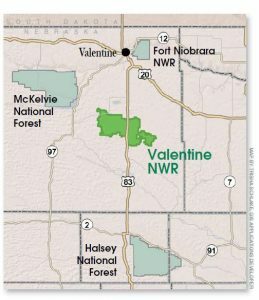 The post Valentine NWR Update appeared first on NEBRASKALand Magazine.